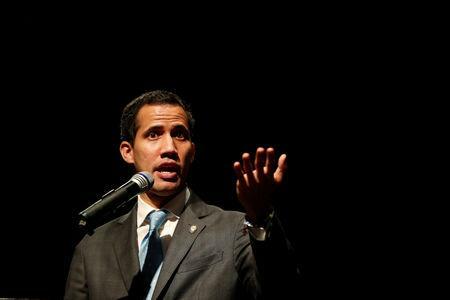 JERUSALEM (Reuters) - Venezuela's self-declared leader Juan Guaido he was working to restore ties with Israel that Caracas cut off a decade ago in solidarity with the Palestinians. Israel is among U.S.-aligned powers that rallied to Guaido after he declared himself Venezuela's leader last month in a power struggle with socialist President Nicolas Maduro, under whom the country has sunk into poverty. "I am very happy to report that the process of stabilizing relations with Israel is at its height," Guaido told the mass-circulation Israel Hayom daily in an interview. Maduro's predecessor, Hugo Chavez, shunned Israel over its 2008-2009 war in Gaza, and fostered ties with the Palestinians as well as with Israel's arch-foe Iran. Israeli leaders said Caracas' posture was prompting a flight of Venezuelan Jews. Maduro, who retains the backing of Russia and China as well as control of state institutions including the military, casts Guaido's rise as a U.S.-orchestrated plot. Guaido says Maduro's reelection last year was a sham.